To connect other computers to the same router, connect cables between those computers’ network ports and the router’s other empty network ports. Click the Start button and choose the Settings icon from the Start menu. When the Settings screen appears, click the Network & Internet icon, then click the Show Available Networks link. The Network & Internet page lists whether you’re connected to the Internet, and offers a Troubleshoot button for fixing common connection problems. Windows places the strongest available network at the list’s top. Choose the desired wireless network by clicking its name and then clicking the Connect button. The closest wireless network is usually the strongest, so you’ll probably spot your own wireless network at the top of the list. 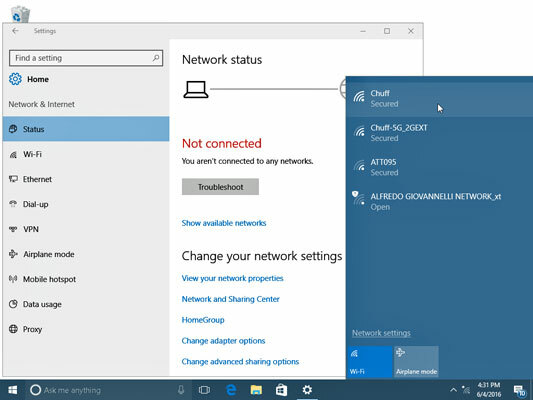 If you select the adjacent Connect Automatically check box before clicking the Connect button, Windows automatically connects to that network the next time you’re within range, sparing you from following all these steps again. Enter a password and click Next. If your router has a little button labelled WPS (Wi‐Fi Protected Setup), you can press it at this point. The router then slips the password to your PC through the airwaves, sparing you from having to type it in. At this point, Windows 10 treats your newly joined wireless network as a public network, the same as one you’d find in a coffee shop or airport. You won’t be able to find or access your other networked computers until you create a Homegroup. If Windows asks to make your computer discoverable, choose Yes: You’re in your own home, and you want your other computers to be able to swap files. But if you’re connecting to somebody else’s network — a public network, for example, click No. You only want your PC to be discoverable when on your own network. Head back to Step 2 and click the Troubleshoot button. Windows 10 performs some basic diagnostics, and resets your networking equipment. If the troubleshooter can’t fix the problem, it offers clues as to the connection-robbing culprit. Cordless phones and microwave ovens interfere with wireless networks, oddly enough. Try to keep your cordless phone out of the same room as your wireless computer, and don’t heat up that sandwich when web browsing. From the Windows desktop, the taskbar’s wireless network icon (shown) providesa one-click way to see available wirelessly networks. If your desktop’s taskbar contains a wireless network icon, click it and jump to Step 3 above.